Climate-friendly electricity from the North Sea and the Baltic is gaining ground continuously. The wind-power plants in these locations generated more than 9 terawatt-hours of power in the first 6 months of 2018. For the foundations, or “footings”, of the wind-turbine installations, the operators of wind farms currently existing or at the planning stage largely rely on thermomechanically rolled (TM) plates supplied by Dillinger, Europe’s leading producer of heavy plate. The decisive reason for this is the plate weight of up to 42 tonnes and plate thicknesses of up to 150 mm, available in Grade S355 M/ML only from Dillinger. In combination with the suppliable plate widths of up to 4,600 mm and this steel’s extremely good workability properties, these plates open up wide-ranging potentials for exceptionally cost-efficient fabrication. One example of this is provided by the 150 turbines of Gemini, off the Dutch coast – one of the world’s largest and most productive offshore wind farms. The globally rising use of offshore wind energy is continuously increasing the already high cost pressure exerted on operators. TM plates from Dillinger and the associated welding processes thus play key roles in the cost-effective construction of monopiles, currently by far the most frequently selected foundation type. 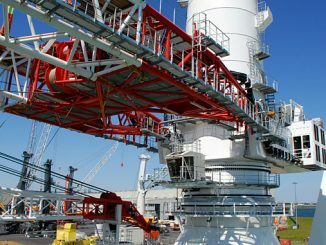 A large number of longitudinal and circumferential welds is necessary for closure of the shell sections and their subsequent joining to form completed monopiles. Automated high-performance welding processes incorporating high deposition rates are therefore used to achieve the necessary efficiency. The preferred process here is submerged-arc welding (SAW), frequently using multiple wire electrodes, in order to maximize deposition rate. Not only cost-effectiveness but also its extremely low susceptibility to welding defects argue in favour of this process, particularly in view of the large wall thicknesses typical of the plates used for monopiles. The preconditions for this are materials which can tolerate these extreme deposition rates without any sacrifice in finished quality, however. TM plates supplied by Dillinger, thanks to their mechanical and workability properties, are the material of choice for the industrial series fabrication of monopiles. They are notable, due to their extremely fine grain structure, for excellent strength and toughness properties. The low amounts of carbon and other alloying elements contained in these steels at the same time assure extremely good weldability. These Grade S355 M/ML steels thus exhibit constantly good toughness data in the Heat Affected Zone (HAZ) even when high heat-input rates are used. In addition, the low CET carbon equivalent of, typically, 0.23, even in plates of 150 mm in thickness (CET ~ 0.21 for 80 mm thick plates), also permits a significant reduction in, or even the complete elimination of preheating for welding. The cost and time benefits which the use of these TM plates achieves in welding-intensive fabrication of monopiles are correspondingly great. Heating-up and cooling-down times can be reduced to zero, depending on the selected parameters, with the result that fabrication shop throughput is significantly increased and energy and labour costs diminished. TM plates in thicknesses of 60 to 110 mm are the standard materials used for the fabrication of monopiles. Dillinger can also supply thermomechanically rolled plates of up to 150 mm in thickness for special applications, however. With an individual plate weight of 35 tonnes – or, in individual cases, even up to 42 tonnes – combined with out-of-the-ordinary thickness in every plate, and with widths of up to 4,600 mm, these plates permit extremely varied and welding-optimized design dimensions. The benefits are readily apparent: the use of especially wide plates makes it possible to reduce the number of circumferential welds, the use of correspondingly long plates and the number of longitudinal welds. Two simplified specimen calculations illustrate the savings potentials which TM plates from Dillinger, thanks to their extreme dimensions and high plate weights, can achieve in monopile fabrication: Four shell sections are necessary for a 12-m long segment of a standard constant plate thickness assuming the section width of 3 m customary on the market. But only three sections are needed when shell sections of four metres consisting of Dillinger TM plate are used. This means one weld less every twelve metres, with the result that, in total, seven welds can be saved for a monopile of 80 m in length. And the cost benefits resulting from the high plate weights which Dillinger can supply are of no less interest: Three plates are needed for a 3.50 m wide shell section, assuming a plate weight of 25 tonnes and plate thickness of 80 mm. But only two plates are needed using Dillinger plates of 35 tonnes in weight, again meaning that one longitudinal weld can be eliminated per shell section. Logistical and transportation costs are also correspondingly diminished thanks to the reduction in the necessary number of plates and shell sections. 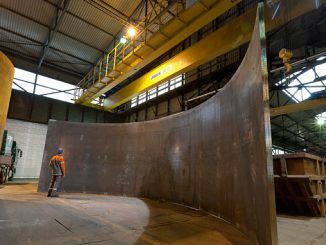 The above-average productivity and other economic benefits of TM plates also proved their worth in the fabrication of the foundations for the Gemini offshore wind farm. This covers an area of some 68 square kilometres off the coast of Europe, to the north of the Netherlands. Here, 150 turbines, each with an output of 4 megawatts and a rotor diameter of 130 metres, produce regenerable power for more than 400,000 households, a total of 2.6 terawatt-hours/a. Gemini is thus currently one of the world’s most productive wind farms. Monopiles of 73 m in length, installed in water depths of up to 36 m, were used for its foundations. 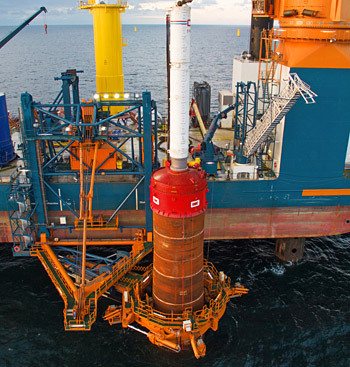 The extreme dimensions and plate weights possible when using Dillinger TM plates offered significant savings potentials, in view of the diameter of these foundations of 7 m at the seabed, tapering to 5.5 m at the transition piece to the tower. Dillinger supplied, within a period of six months, more than 4,000 plates in thicknesses of up to 95 mm and plate weights of up to 32 tonnes for the construction of these foundations. In this context, the heavy-plate producer expertly made the most of the strengths of its plates, by means of welding-optimised dimensions and just-in-time deliveries. During the delivery year of 2015, the heavy-plate supplier operated to the then existing limits of its capabilities, with the plate weight of 32 tonnes. Only two years later, this maximum had been raised to 35 tonnes, and then, another year later – in 2018 – the new limit, of 42 tonnes plate weight, again underscored its technological leadership. 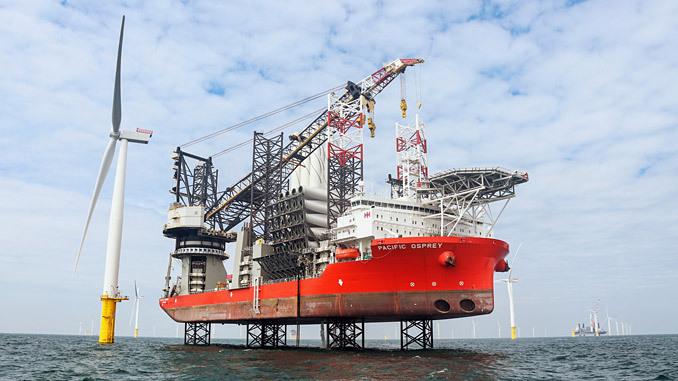 This unceasing further development of potentials is Dillinger’s reliable response to the market demands of the price-sensitive offshore wind-energy sector for ever thicker and ever more efficient TM plates. 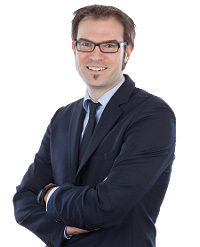 Dr Tobias Lehnert is a Marketing Manager and provides technical support at Dillinger.